Any worker who works with or in proximity to a controlled substance needs WHMIS training. Why is the training computer based? On-line or computer based training provides both consistency and flexibility. It provides employers with the opportunity to use unexpected down time in a cost effective and productive manner. And by using a database driven system, it provides a method of not only testing the knowledge of participants, but it also documents the results. Training can be provided 7 days a week, 24 hours a day to employees both at work and at home. No more lost productivity and no more booking training rooms or renting training facilities or hiring trainers. What could be simpler! Both our WHMIS and TDG courses take approximately 90 minutes to complete. What does WHMISdirect.ca’s WHMIS course cover? The course is designed to comply with the general or generic components of Provincial WHMIS Legislation. It is structured to meet the needs of both employees and employers alike. The course features four elements or segments to the training including background and explanation of WHMIS Legislation, Hazards, Workplace Labels and Material Safety Data Sheets (MSDS). Please Note: This training program is NOT meant to replace the workplace specific elements of the legislated requirements of WHMIS. Do I need to re-certify and if so, how often? The Occupational Health and Safety Act states that all training must follow WHMIS guidelines and must be reviewed annually to ensure your employees know, retain, and follow safe practices. Do government regulations require a WHMIS certificate? As per Health Canada’s website “WHMIS laws do not require that workers be issued a ‘certificate’, card nor any other document to demonstrate that they have received generic education or site-specific WHMIS training.” So although not required, WHMISdirect.ca’s training course provides a certificate of completion to show proof that a trainee has completed the course successfully. You can obtain help sending a support request to us from the Contact Us page. If you cannot remember your login credentials, click here and we will send them to you to the email address you signed up with. We support the following Operating Systems: Windows 98, XP, Vista, 7, Mac OS X 10.0+, and Linux. We support the following Internet Browsers: Internet Explorer 6+, Firefox 2.5+, Safari 3+. Flash and Adobe Reader are required. While most modern Internet Browsers that support Flash should work, our support department can only assist you with these Operating Systems and Internet Browsers. Officially, no. While most up-to-date Browsers that support Flash should work, our support department can’t assist you if you’re using one of these devices. What should I do if I have trouble logging into my account? Most of these difficulties are caused by the settings on your computers. The easiest way to solve them is to clear your “cookies”. Follow these steps for Internet Explorer: Go to the ‘Tools’ button on your internet window and drop down to ‘Internet Options’. It will take a minute for the cookies to delete. Once the operation is complete, close the box and log back into the course. If this does not work please contact customer support. I am using a dial-up connection and my course is running slow or not playing at times. What can I do? Unfortunately, we cannot control the speed or reliability of dial-up connections. Dial-up performance will depend on many factors. For more information, please contact your internet service provider. For optimal performance we recommend using a high-speed internet service. Can I purchase a course without registering? No. Because we have to know your name and address in order to send your permanent wallet card to you, you must register on our site in order to purchase a course. No. You can log out at any time and when you log back in you will be able to continue from where you left off. Our courses do not have a time restriction. After I purchase, do you send me a CD or book? Yes. An exam can be paused at any time. When you are ready to continue your exam simply go into exam history and select the exam you paused. My supervisor requires me to show proof of successfully passing each exam before moving on to the next module. How can I do this? Take a print screen of the page by pressing the PRTSC or PRTSCN button on your keyboard. Paste the screen (Edit -> Paste menu or Ctrl+V key) into an email message and send it to your supervisor. Note: Some keyboards or mobile PCs that don’t have the PRTSCN button might use other keyboard combinations, such as FN+INSERT, to take a screen capture. Check the information that came with your computer or the manufacturer’s website for more information. In the rectangular box entitled “Documents Available / Issued” look for the word “Issued” (it should be underlined). Click the green down-arrow beside the word “Issued”. 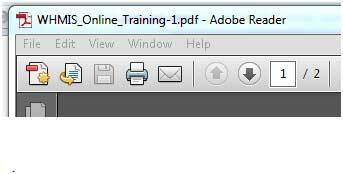 A window entitled “WHMIS_Online_Training-1.pdf - Adobe Reader” appears. A temporary wallet-card and wall-mountable certificate you can print is in this window. Click on the printer icon to print your a copy. You can repeat this process and print as many copies as you need whenever you need them. Do you offer bulk discount pricing? Yes! The quantities and discounts are listed on the page for each course. When you are logged in click on the “Manage Users” button, then click the “Add User” link on the next page. If you have several students to register at once, you can use the “Bulk Add Users” link instead. Complete the form on the registration page, making sure you select the “Send Welcome Email” box to ensure the student receives the email with their username and password. When you are logged in click on the “View / Purchase Courses” button, then click the “Purchase Credits” button on the next page. On the following page, enter the number of courses you wish to purchase, then click the “Add to Cart” button. The next page will show you the total of the courses you added, with the bulk discounts included. Click the “Proceed to Check-Out” button, and on the following page fill in your credit card details and complete the transaction by clicking the “Purchase With Credit Card” button. How do I enrol students? Now that you have registered students and purchased course credits, you can enrol them in their courses. When you are logged in click on the “Distribute Courses” button. On the next page make sure the “My user(s) already have account(s)” option is selected and click “Next”. The following page shows all your registered students. Select the checkbox next to the name(s) of the student(s) you wish to enrol in a course, and click “Next”. The next page shows you the courses available to assign to the student. Under Program Credits Available, click the checkbox beside “WHMIS Online Training (X Available)” (where X is the number of course credits you have left), and click “Next”. Finally, confirm that the course choices are correct on the next page, and click the "Finish" button. The student(s) all now enrolled in their course(s).